I love love love this pie. It tastes as pretty as it looks, plus its easy to make. In a electric mixer bowl, mix butter and sugar until it becomes fluffy. Mix egg and vanilla extract into the butter mix. Shape the dough onto the pie tray, bake on 400F for 5 minutes then reduce the heat to 350F and continue baking for another 15 minutes till it turns golden. This mixture will make a nice, sweet smelling and a bit crumbly pie crust. In a bigger pan, mix in egg yolks, egg, corn starch and 1/3 cup of sugar untill well blended. Drizzle the milk mixture, butter and vanilla extract into the egg mixture and boil until it gets thickened and form a custard texture. STIR CONSTANTLY TO AVOID BURNT CREAM AT THE BOTTOM OF THE PAN. Before filling the pastry cream onto the pie crust, make sure the crust and the cream are completely cooled. Tips: layer the crust with butter (apply with brush) onto the crust before filling with the cream, this will keep the crust from sogging. 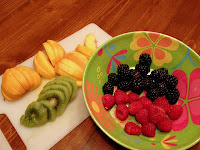 I suggest to use fresh and rather sour tasting fruits to counter-balance the sweetness of the custard. 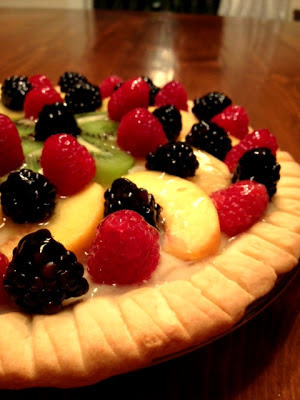 With different color of fruits, you can decorate your pie anyway you like and it will turn beautiful no matter what. Drizzle the jelly glazing once you are done decorating, it will keep the fruits in place and make a nice moist-glazed look.